Help me kill these things! There are a bunch of weird little insects in my office. 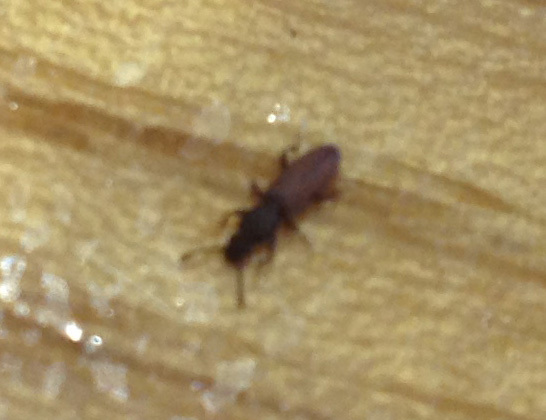 That photo isn't to scale - I'd say they're maybe an eighth of an inch/3 mm long, really tiny, and they like to congregate in little groups underneath various things on my desk. What are they? What do I do about them? Backstory: I believe these things initially got in through a window and bred in a small box of pollen patties I had accidentally left on the floor of my office. One day a week or two ago, I noticed that the box had a bunch of these bugs crawling on it, so I threw it away. Underneath it were a handful of what looked like tiny maggots. :/ I cleaned those up as well. Unfortunately it seems that didn't eliminate the problem. I have been seeing them around my desk almost every day, maybe 8-10 of them in the morning and a couple random ones over the course of the day. I smush them and then there are more the next day. They are pretty slow and seem to have pretty bad reaction time - if I pick up an object and they're underneath it, they don't have time to escape me. I don't think they can fly. We have wall-to-wall dark blue carpet, and I wouldn't be surprised if they were hanging out in there. Can anyone identify them and help me figure out how to get rid of them? Ugh, this is so embarrassing. They're beetles. I don't know what kind; hopefully somebody more knowledgable will come along with specifics. But they don't look like carpet beetles, and they aren't going to bite you, and I'm reasonably confident they won't do any major structural damage to your office. The infestation should go away after you remove all sources of food - any boxes of crackers or cereal or bottles of spices laying around? I'm guessing there are still eggs or larvae somewhere that a daily wipedown with disinfectant will help get rid of. Yeah, those look like grain weevils. We had them in our kitchen for ages and couldn't work out where they were coming from until we opened an old packet of brown rice and realised the blighters were living IN the grains themselves. Yuck. Check through any packets of food stashed away and the problem will solve itself.